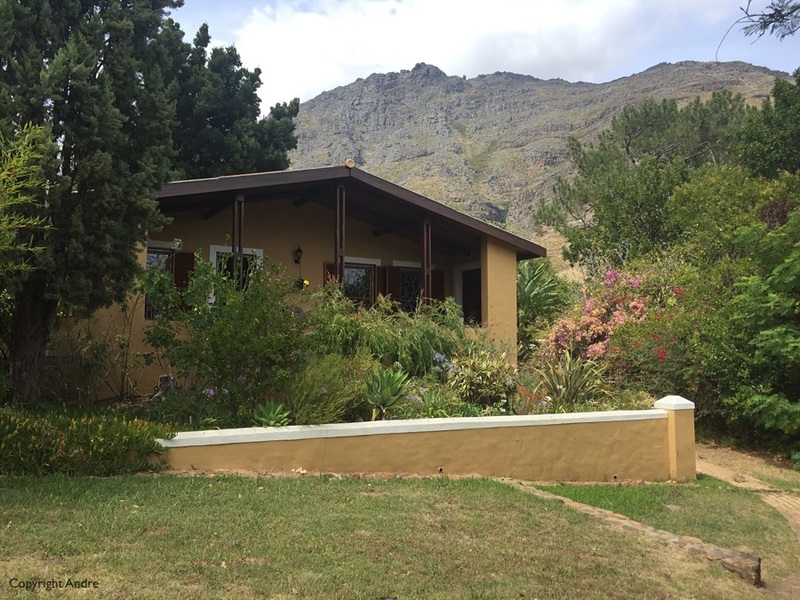 First stop were four original houses, oldest one being Schreuder House of 1709. 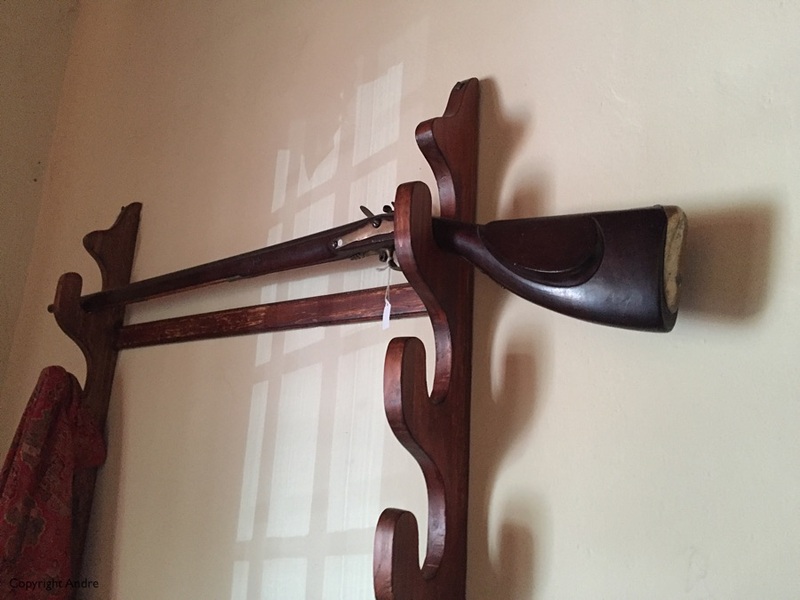 Plenty of bibles and the odd firearm says it all. The docent in the above photo is wearing period costume and gave a good overview of the early settlers. I must have been taught this during my schooling but history and especially Afrikaaner history did not interest me at the time. How times change. 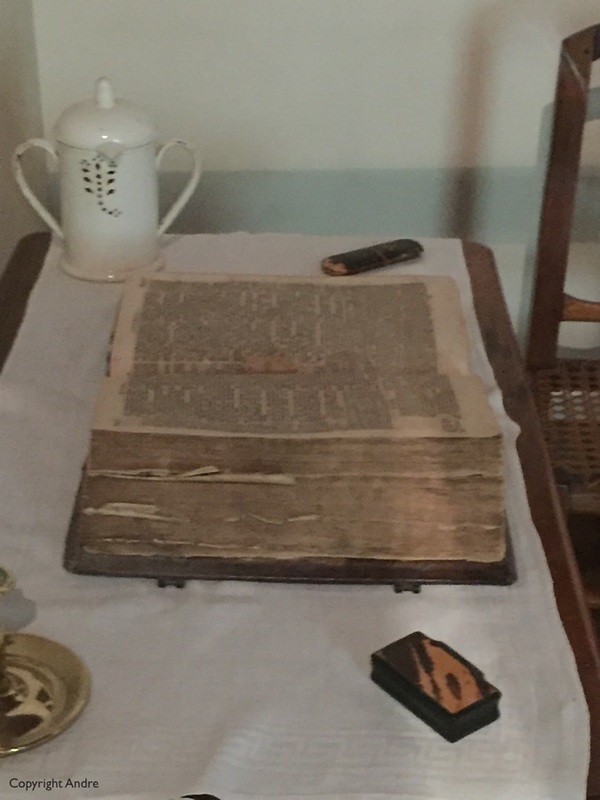 Plenty of early bibles on display. On to the main purpose of our excursion into the vineyard laden mountain slopes. We had ordered a picnic lunch basket to be consumed under the old oaks. Monday was not their busy day and there was only one other like minded couple to share the lawns with – nice. Picnic lunch included a four legged playmate. 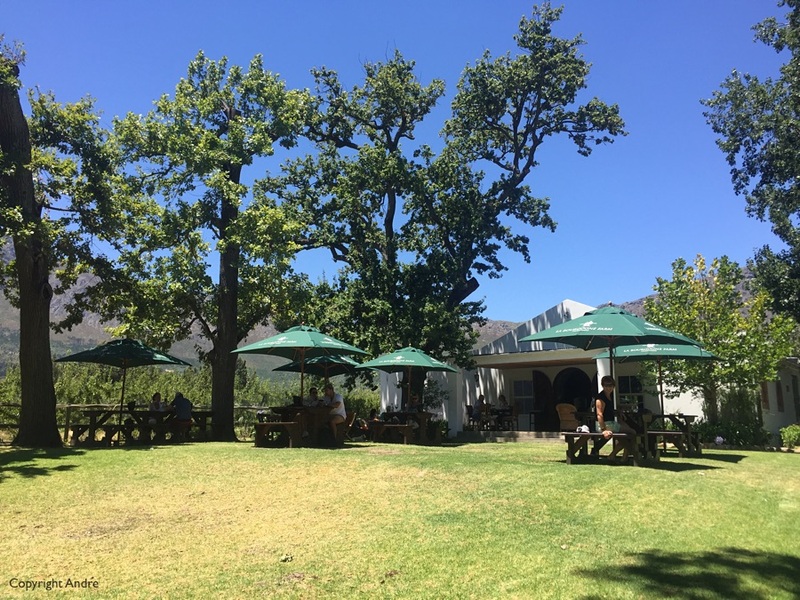 A must on a wine farm. 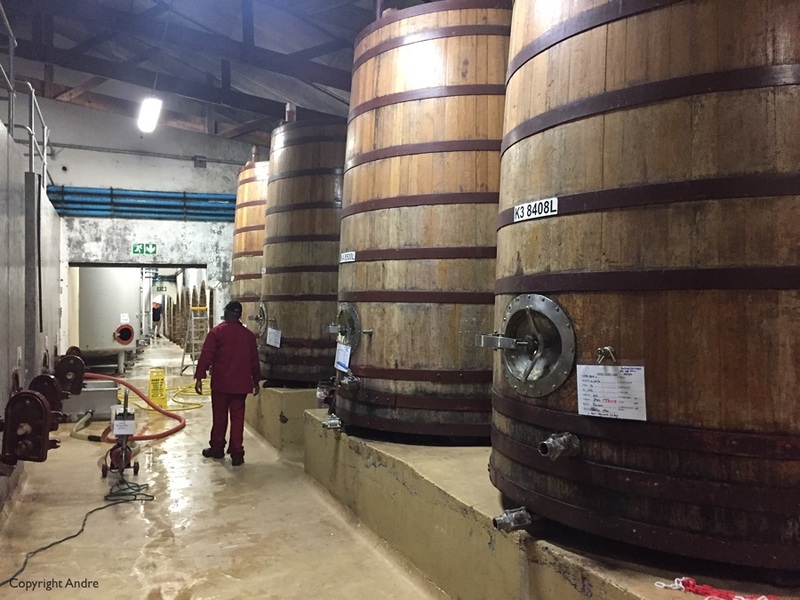 You pass some of the vats on your way to the tasting room. 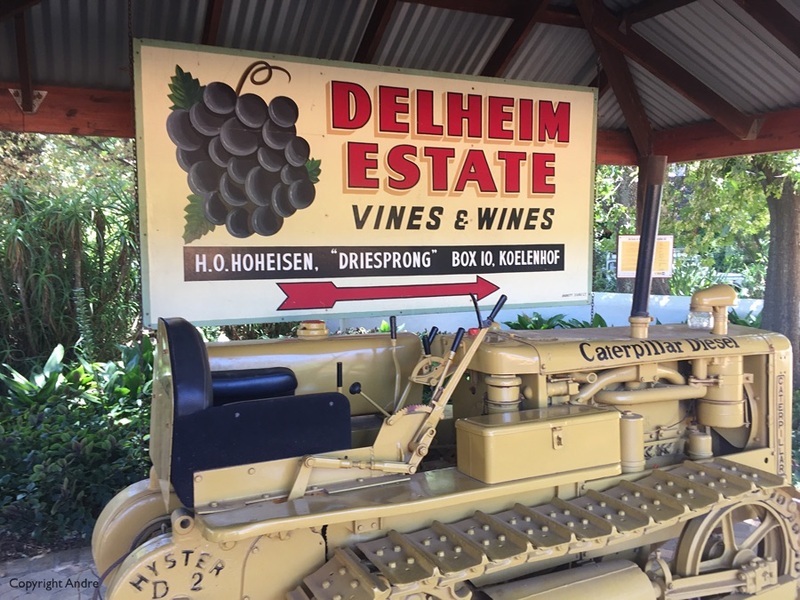 Had a tasting in the Delheim cellars, one of my old favorites, and their wines did not disappoint. 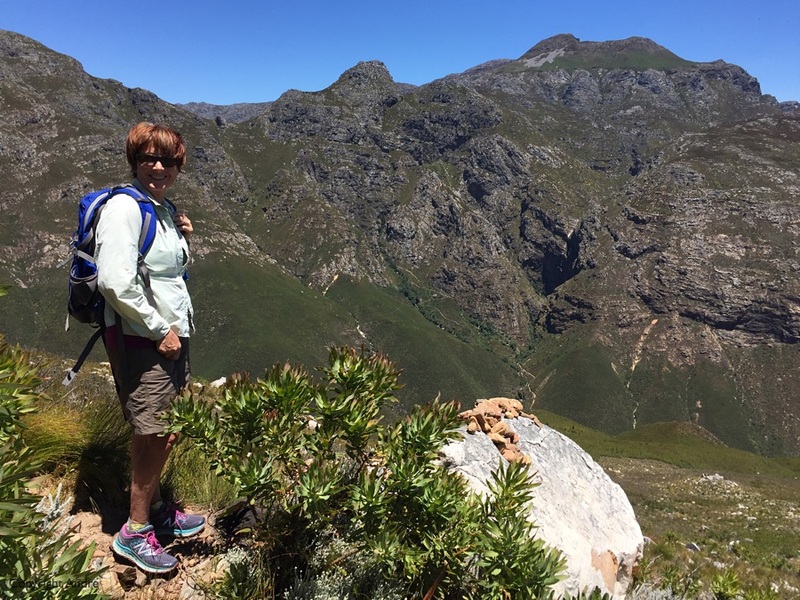 A hike up Jonkershoek kloof. 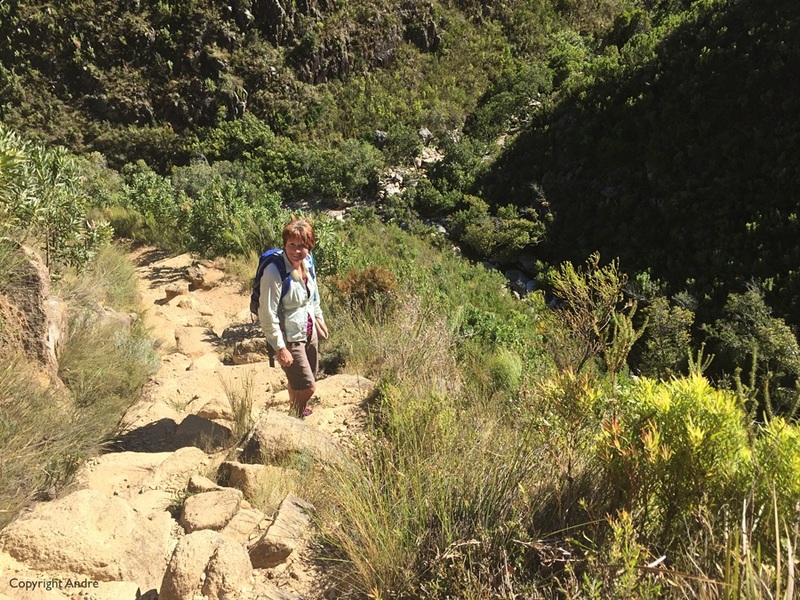 Next day I told Rose we’d go for a short morning walk and headed out to Jonkershoek Reserve at the end of the valley. Our WildCard got us in but the gatekeeper asked if it was our first visit and suggested the waterfalls hike, 3 hours round trip. I asked about the Panorama Trail but he said we should come back another time for that as it was a 6 hours hike. 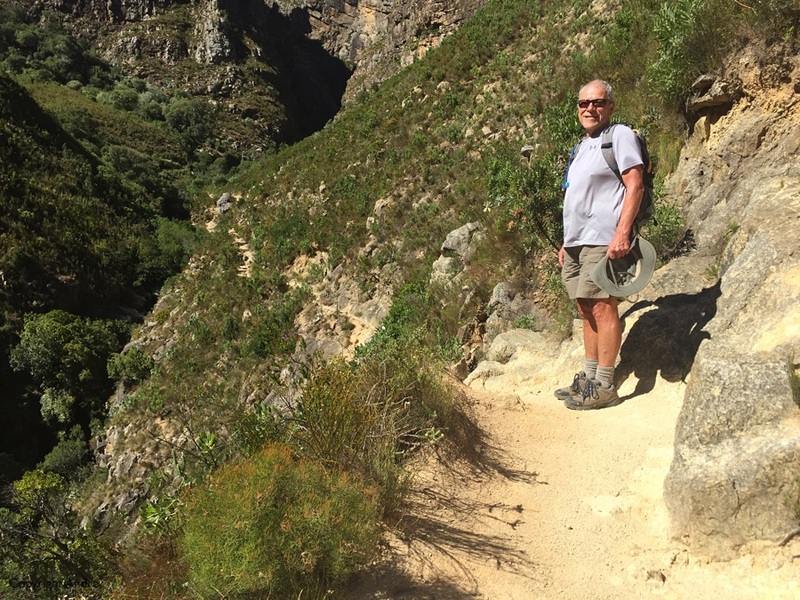 Set off and soon started gaining altitude as the path entered a small gorge. Signpost said waterfall #2, must have missed the sidetrip to #1 a while back. 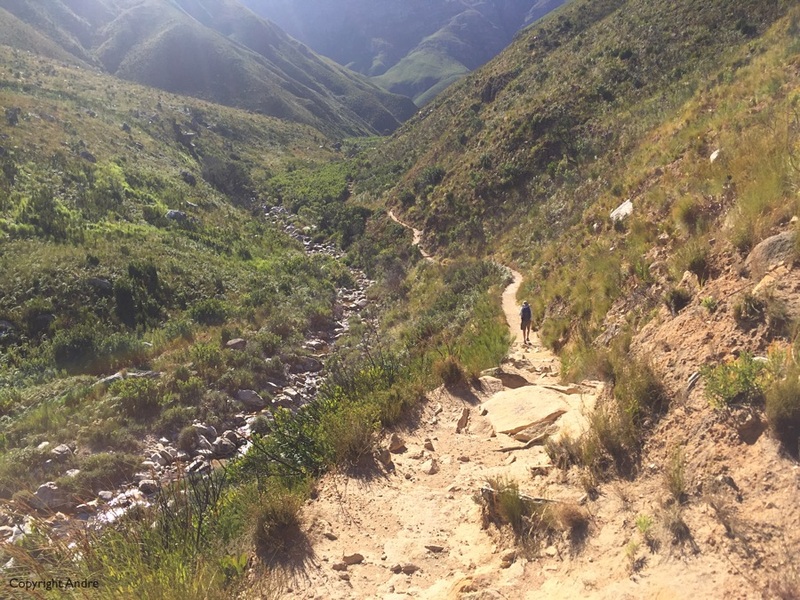 Clock said 1 hr so I said lets go for the Panorama version which takes off from here up a steep gully called “Kurktrekker” or Cork Screw. Aptly named as the messy path curled it’s way up and out onto a saddle. 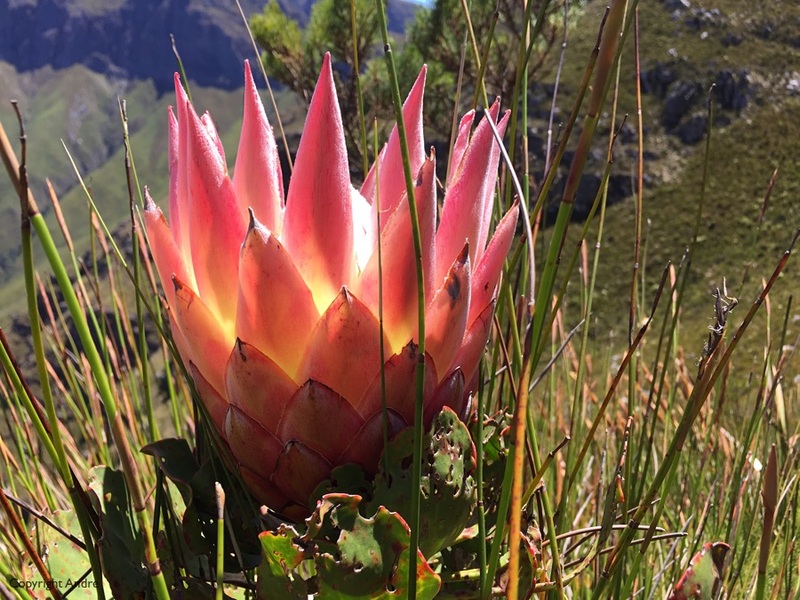 The Protea, South Africa’s national flower. Love it when they’re all over the place. 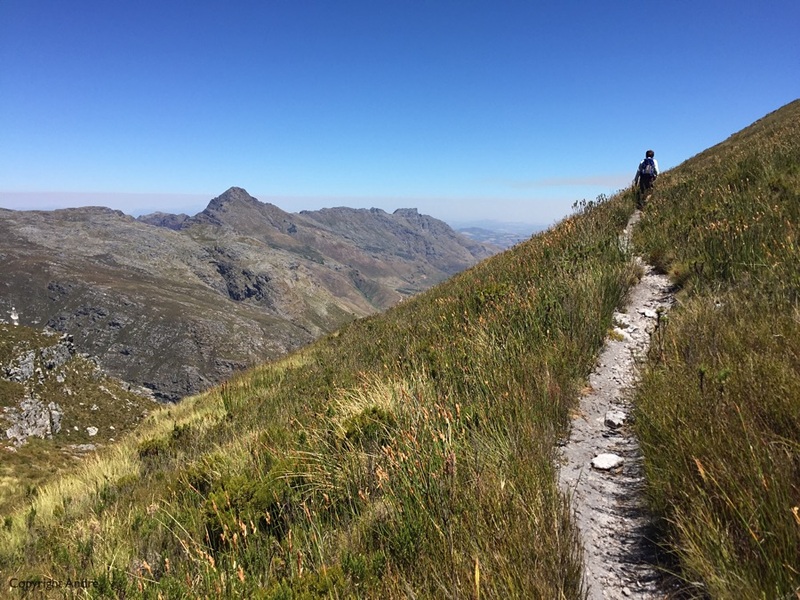 From the saddle we traverse up and down a ridgeline. 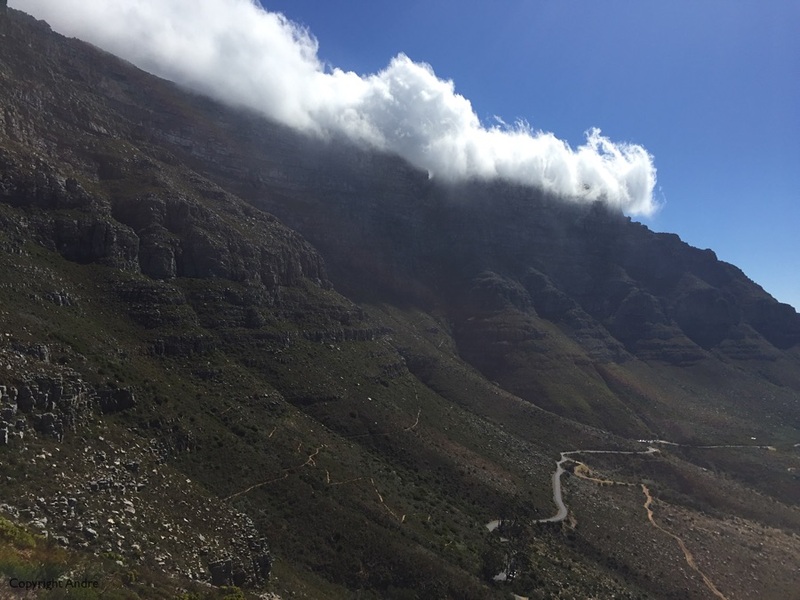 Craggy Cape mountains. Don’t want the clouds to come in and obscure the gullies to the left. Route down off the ridge. 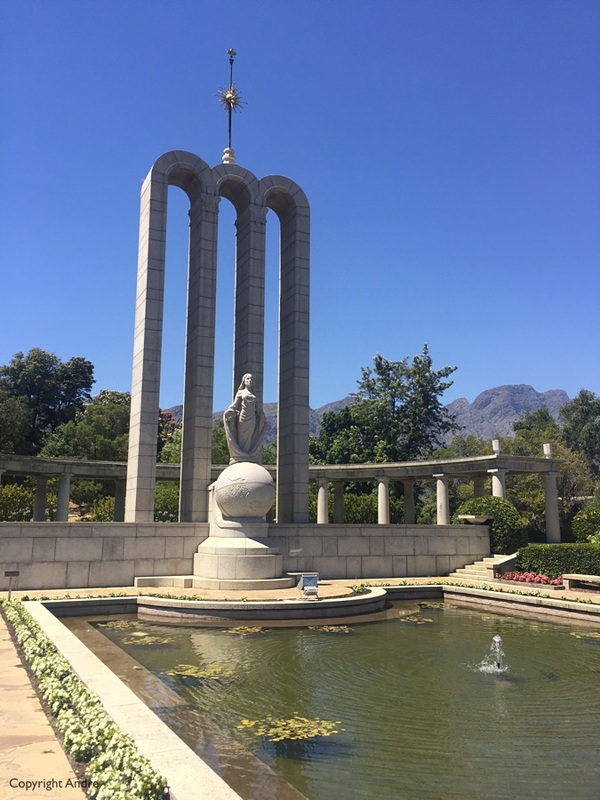 A short drive outside Stellenbosch is Franschoek (French Corner) and the French Huguenot Monument, another place I never visited in my early days. 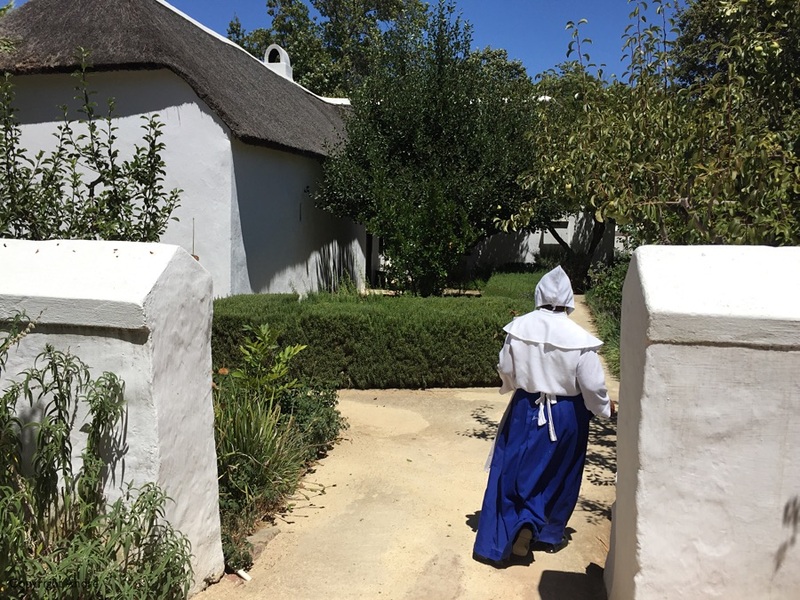 Escaping religious persecution in Europe during the 17th century a small number made their new home here. The woman in the monument had a bible in one hand and a broken chain in the other. Religious freedom and casting off her oppressors. They were quickly assimilated into the Dutch society and all that remains are farms named after regions in France. 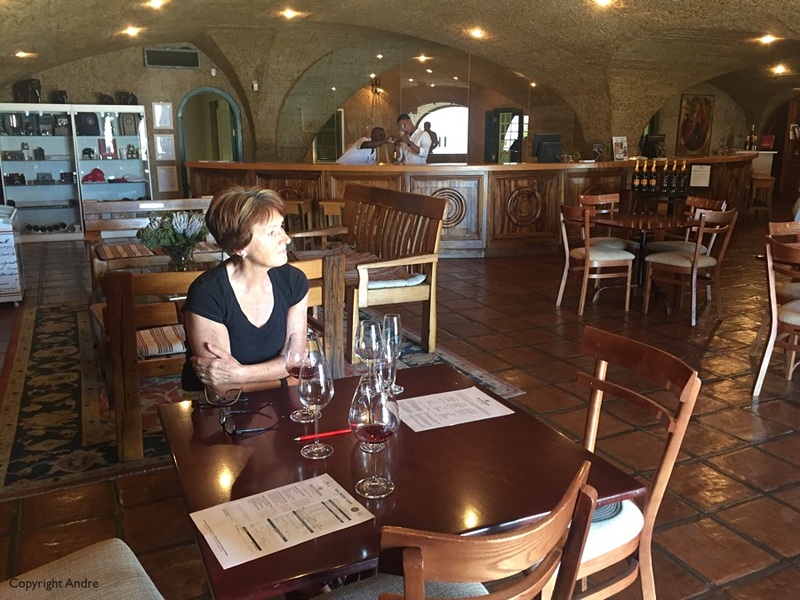 Haute Cabriere winery’s tasting room. La Bourgogne tasting and snacking on the lawn. 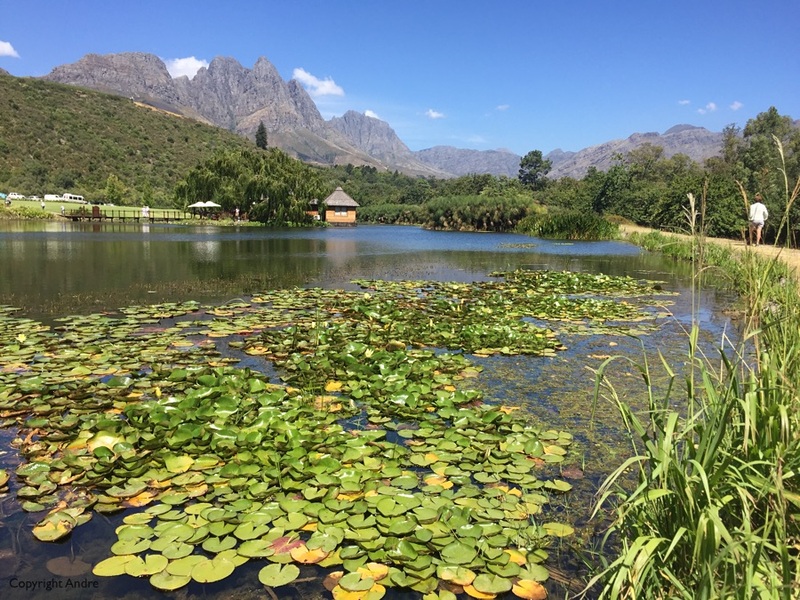 Did a complete lucky dip for the next winery and picked La Bourgogne just outside Franschoek. There was a gate and a key pad at the entrance but we just coat tailed through the car in front. Walked around to the tasting area and we were in. Had a nice cheese & meats plate to complement the wine and starve off the hunger pains. 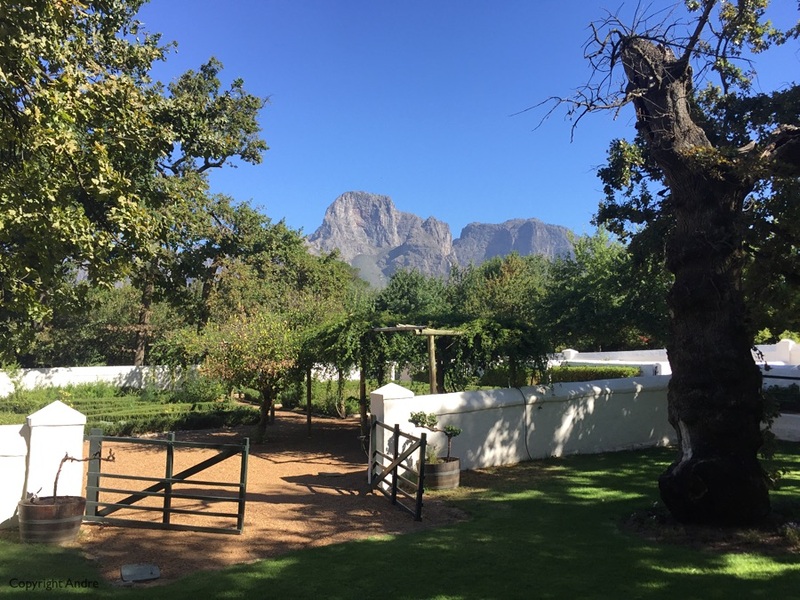 Boschendal on the way home. 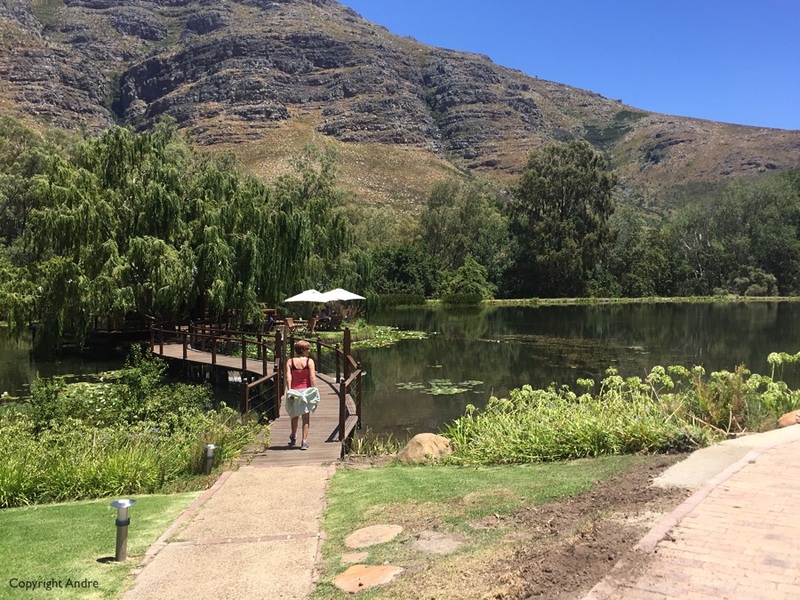 Next day we walked over to Stark-Conde and they have a unique tasting island amid a large pond. Very mellow indead and we came back the next morning for breakfast at their little cafe. 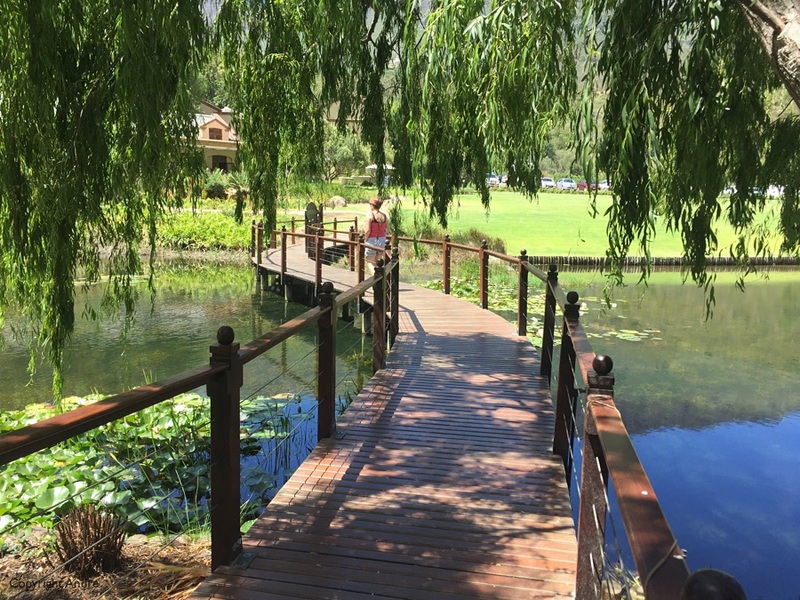 Walkway from the tasting area. That’s looking back into the mountains that we hiked. Our cottage for the week. 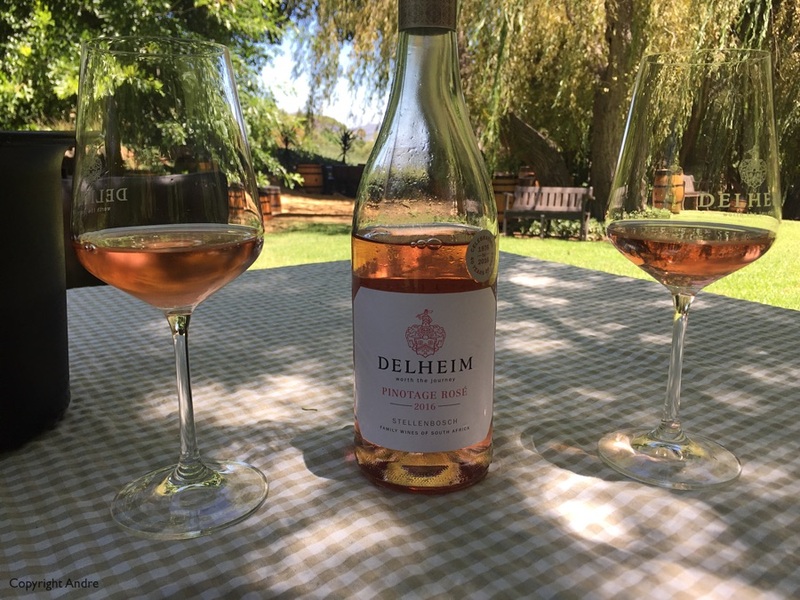 Wanted to go back to Delheim but Muratie is on the way. 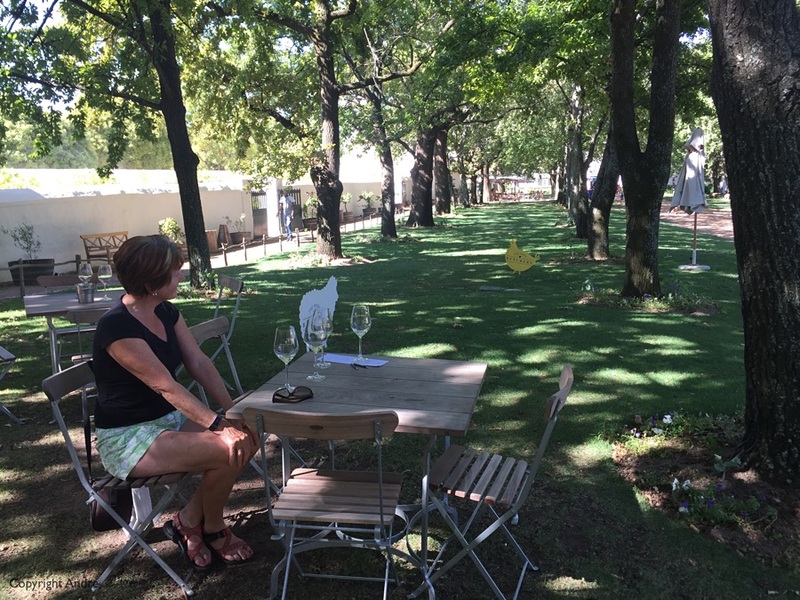 You have to drive through Muratie to get to Delheim. 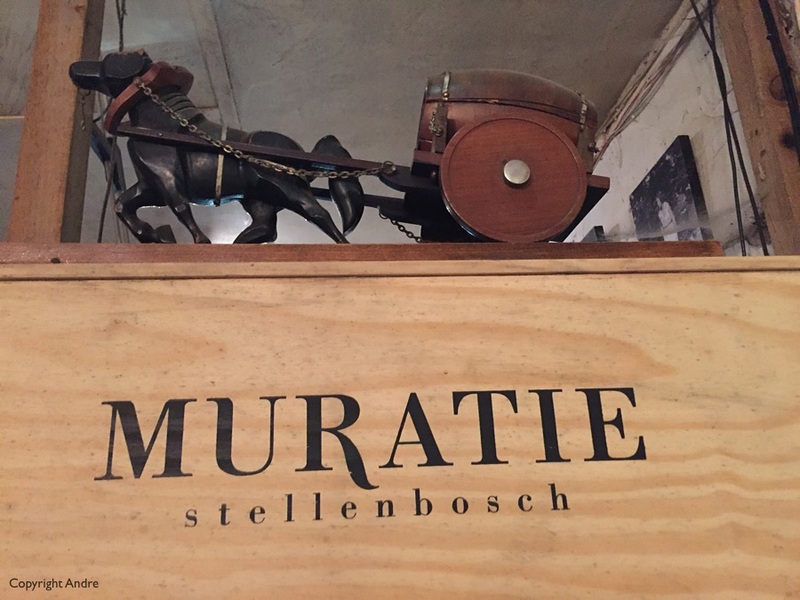 Muratie is one of those classic old farms that don’t change. 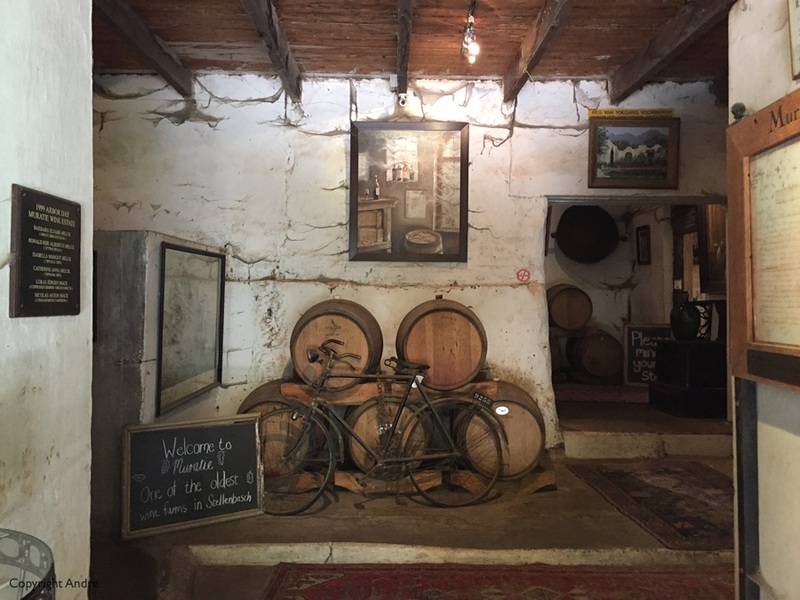 The entrance makes you feel you are in a museum, which you are, and the wines tasted the same as they were 35 years ago when I last visited. 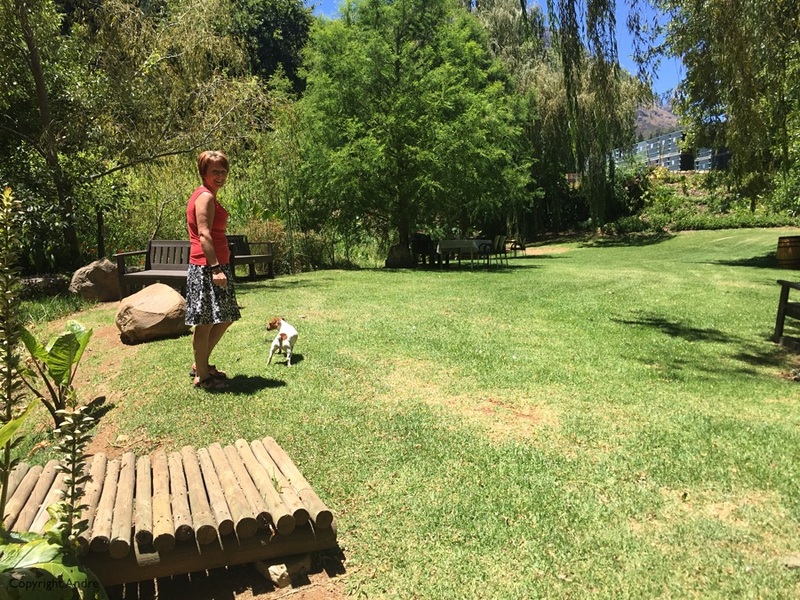 Last day we visited Eikendal and a very commercialized Spier on our way home to my brothers house. 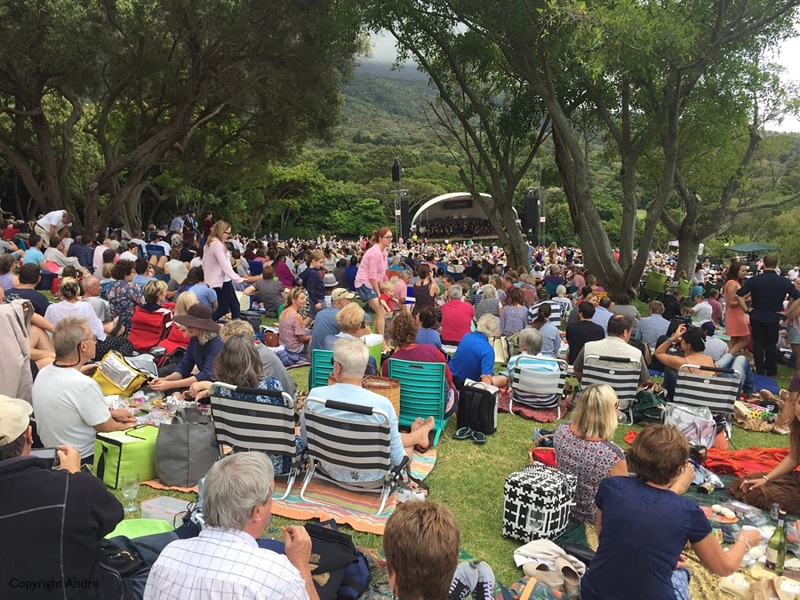 Open air concert at Kirstenbosch on the slopes of Table Mountain. 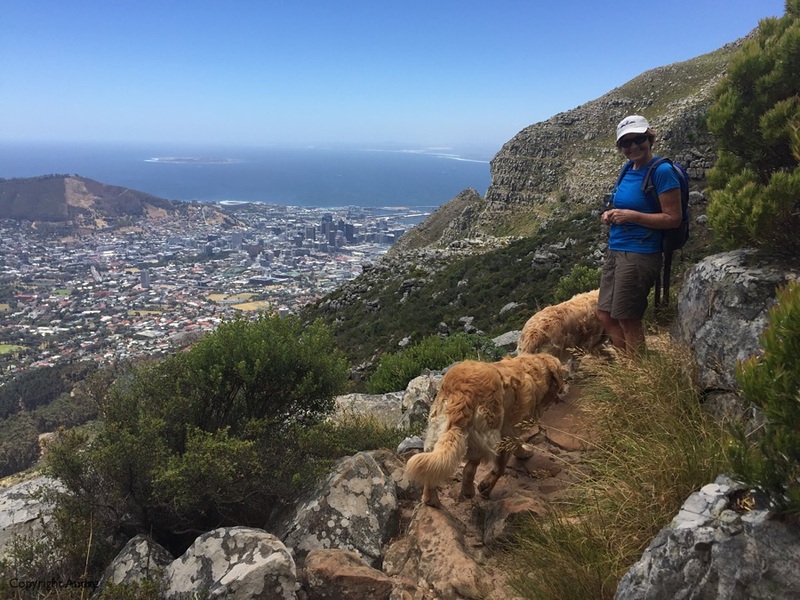 Rose on Table Mountain with two of Pete’s Golden Retrievers. 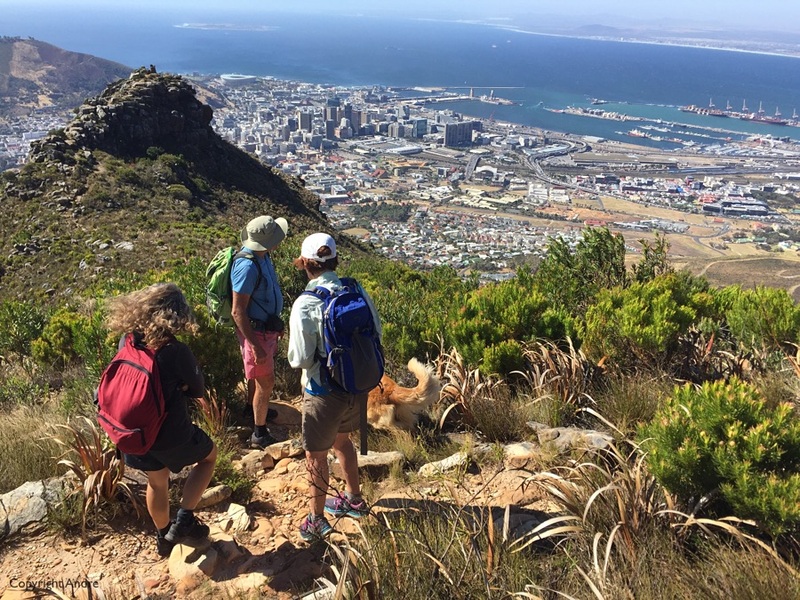 Wednesday afternoon we get invited to hike with a bunch of folk that just love the mountain. 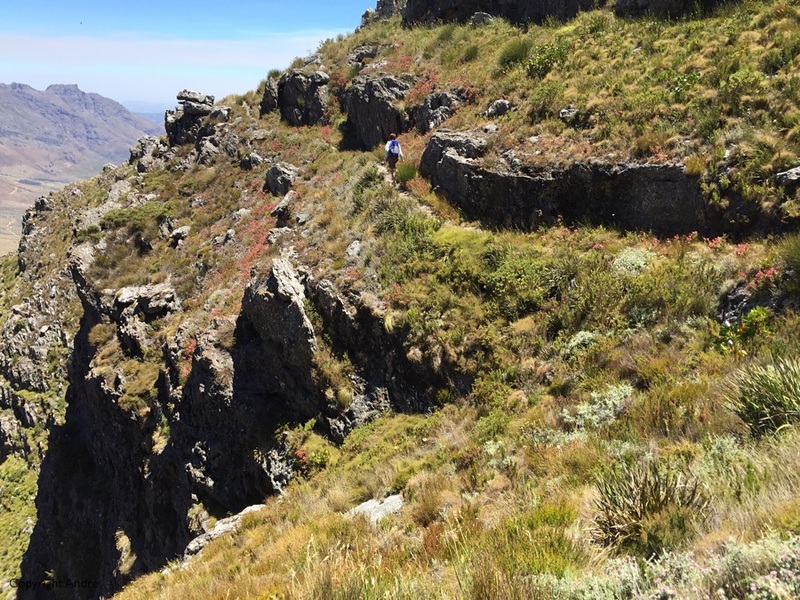 Pete has been all over it and takes us from Tafelberg Road, up to the saddle between Devils Peak and Table Mountain proper, over to the Pulpit, out to Oppelskop and back down again. Wind blew like hell. Lift one foot up to take a step and if a gust hits you you’re off the path. A stiff southeaster as the locals will say. 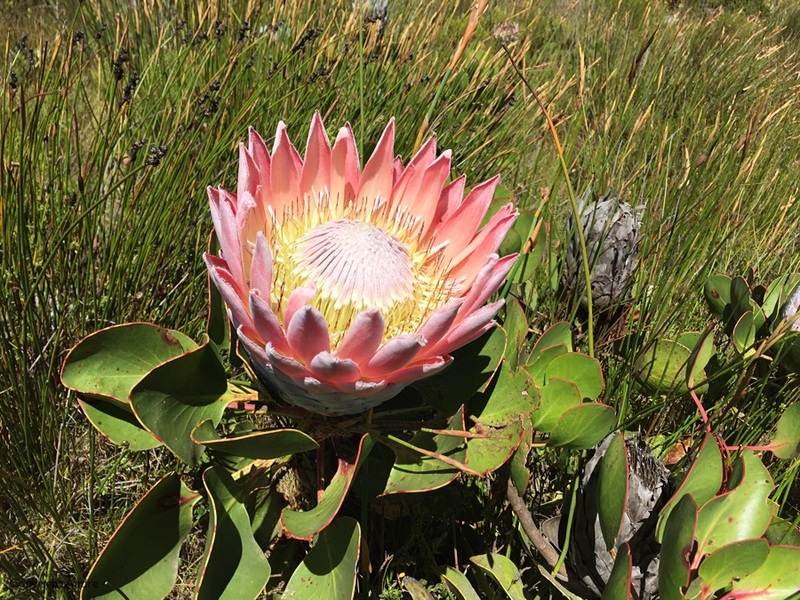 That’s the tablecloth on Table Mountain. 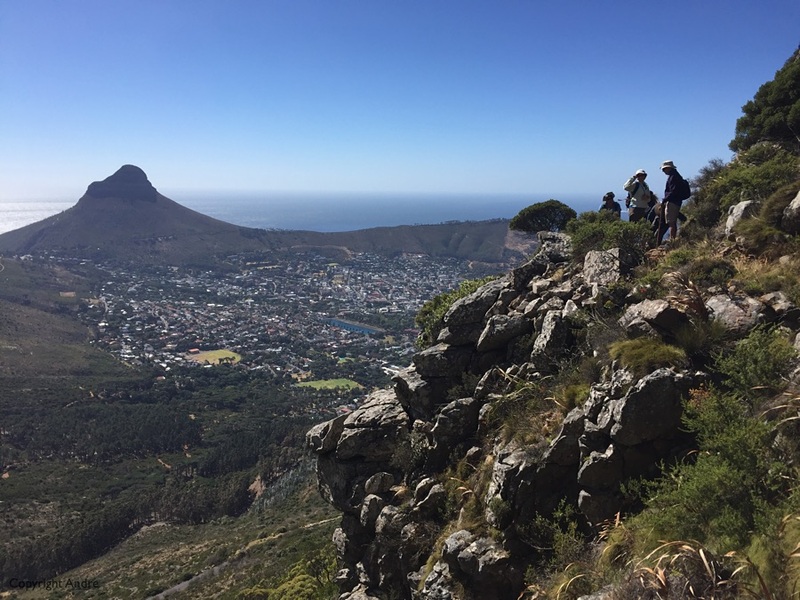 Over to Lions Head and the city below. 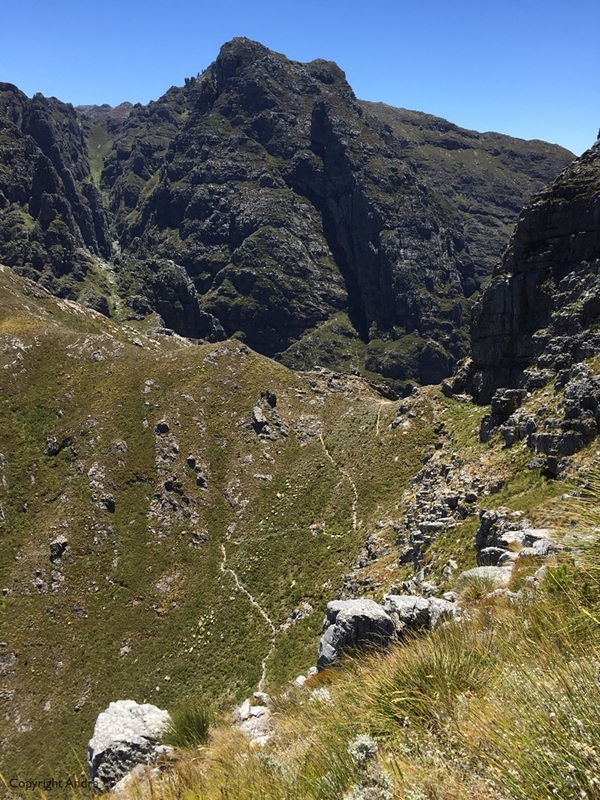 Oppelskop in the left foreground and Cape Town harbor below. Afterwards it was pizza and wine -a really great bunch of people (and dogs) and Rose & I thoroughly enjoyed it.